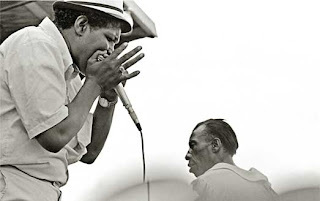 One of the last great traditional blues singers, Willie Mae Thornton was born on December 11, 1926, in Montgomery, Alabama, where her father was a minister. As a child, she began singing in his church and taught herself to play the harmonica and drums. With the death of her mother, Willie Mae at 14 went to work. While scrubbing fioors in a saloon, she was drafted to fill in for the establishment’s regular singer, and a performing career was born. Thornton soon joined the Hot Harlem Revue, a traveling show that toured African-American communities in the Southeast. Because of her powerful voice, she was billed as “the new BESSIE SMITH.” Other blues greats that infiuenced her style included GERTRUDE “MA” RAINEY and Memphis Minnie. By 1948, Thornton was working clubs in Houston, Texas. She was signed to Peacock Records by owner Don Robey, who began helping her choose material and directing her onstage appearance. Thornton made her first record in 1951 and the next year she was recruited for the nationally known touring show led by Johnny Otis. With Otis, Thornton began playing venues in the North for the first time. Her full-throated style of country blues became one of the show’ s highlights. Six feet tall and nearly 300 pounds, Thornton earned the nickname “Big Mama” both for her imposing physical stature and her oversize personality. In 1953, Thornton recorded her biggest hit, “Hound Dog.” The song was credited to songwriters Jerry Lieber and Mike Stoller. According to Thornton, “[T]hey had this song written on the back of a brown paper bag. So I started to sing the words and put in some of my own.” Characteristic of Thornton’s work, the record features her growling and shouting sexually explicit lyrics about a no-good lover. Although it sold more than half a million copies in the urban African-American market, Thornton received a total of only $500 for her work. Even more galling, she saw absolutely no compensation when Elvis Presley’s 1959 cover of “Hound Dog” became a sensation, rocketing Presley to stardom. Thornton’s success continued as Robey paired her with his other star, ballad singer Johnny Ace. They became a star attraction, called by some “the king and queen of the blues.” Their partnership ended at a Christmas dance in 1954, when Ace accidentally killed himself during a game of Russian roulette. In the wake of the tragedy, Thornton’s popularity began to wane. 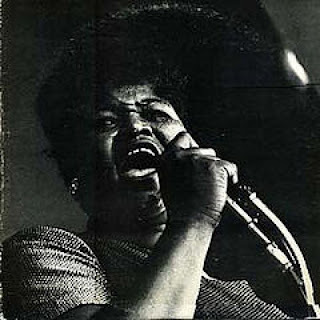 She stopped touring with Otis in 1955 and moved to San Francisco, California. Without a record contract, Thornton began playing small local clubs in the late 1950s. After several lean years, a renewed interest in the blues by early rock artists brought Thornton back into the public eye. Following her appearance at the Monterey Jazz Festival in 1964, Thornton became a regular at jazz and blues festivals and at the best clubs in the United States and Europe. 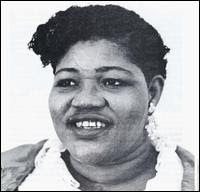 Her recording career was revived as well with a string of albums, including Big Mama Thornton with the Chicago Blues Band (1967), on which her band included musicians Muddy Waters, James Cotton, and Otis Spann. In the late 1960s, Thornton also became known as an inspiration to rock singer JANIS JOPLIN, who imitated Thornton’s style and mannerisms on stage. One of Joplin’s signature songs was her cover of Thornton’s composition “Ball and Chain.” For the second time, Thornton saw one of her songs help a white artist rise to international fame. Always a heavy drinker, Thornton began to suffer from cirrhosis of the liver in the late 1970s and early 1980s. Even though the illness shrunk her body to less than 100 pounds, she continued to perform despite her physical frailty. 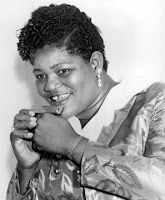 On July 25, 1984, Big Mama Thornton died of a heart attack in a Los Angeles boardinghouse. A week later, friends and fans came together at a benefit concert organized by the Southern California Blues Society to pay for her funeral expenses. Gart, Galen, and Roy C. Ames. Duke/Peacock Records: An Illustrated History with Discography. Milford, NH: Big Nickel Publications, 1990. Shaw, Arnold. Honkers and Shouters: The Golden Years of Rhythm and Blues. New York: Macmillan, 1978. The Complete Vanguard Recordings. Vanguard, CD, 2000.